I'm not an outdoors person. I don't like bugs. I don't like the heat. I'm not really into outdoors stuff. But I LOVE 4-H camp and the magic that happens when teens use their leadership skills to deliver the camp program! For more than 20 years, I have been coordinating an overnight 4-H camp for grades 3-6, as well as day camps. My goal for the campers is that they are safe, have fun, make new friends and want to come back the following year. What motivates me to coordinate camps? It's the magic that happens when teenagers become camp counselors! I strive to apply these principles within the training for camp counselors and then guide the teenagers to create this environment for younger campers. 4-H camp is an authentic opportunity for camp counselors to use their skills in real time. They learn skills and then apply them in the planning, implementation and evaluation of an actual camp. In Van Linden and Fertman’s book, “Youth Leadership: A Guide to Understanding Leadership Development in Adolescents”, they describe three stages of leadership development – awareness, interaction and mastery – which are sequential but fluid. Awareness is when a young person realizes they have leadership skills and is capable of being a leader. Interaction is about action. It’s testing possibilities, reaching limits, resting and reflecting. Mastery involves having the energy, resources and guidance to pursue a personal vision. When a young person comes to my camp counselor program, they are at the interaction stage. They believe they have the skills to be a camp counselor and are ready to interact and master. I model the youth development principles with the camp counselors as they learn, develop and implement a camp for younger members. They master these skills when they return the next year as camp counselors and take on more responsibility for different aspects of camp. I may not like bugs and the outdoors, but I do love the mastery that teenage youth gain as 4-H camp counselors! Thanks Kate! I have seen the notice for the new issues of the Journal for Youth Development. It's on my list to check out! I'm with you - not a fan of camp but strongly believe in the positive experiences it provides for campers and youth leaders. I appreciated your point about mastery that happens when they return as counselors for a second year. Moving up the "ladder of leadership" is so important. Thanks Becky! The camp counselor experience gives youth the confidence to utilize their skills in other parts of our program - State Ambassadors for example. And continue to "master" their leadership ability in all parts of their life. I had such mixed experiences as a youth at camp. 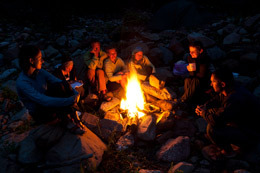 Being a camper was often a lonely and isolating experience. There were several camps I tried once and never returned to. But later in my youth, I was scaffolded into camp leadership roles...junior counselor, counselor and camp director. It was there, as a leader, that I found my confidence, my joy and my power to create safe and meaningful experiences for others. I love how much young people can grow at camp when they're given leadership roles. Even kids like me who were crummy campers can fall in love with camp and discover their ability to make a difference...when we lead. Thanks for sharing Erin. I'm glad you found your "place" at camp where you could grow and be empowered. I am striving to train teen-aged youth about positive impacts they can have on campers, so they have a positive experience, not a lonely one like yours. I listened to the podcast this week and was so intrigued with how Karyn was able to share so much more information in just 20 minutes! Thinking about the steps to prepare a young person for a more active leadership role is exciting as we as youth development professionals not only can help guide that process, but also witness it in action.